Is the age of 50 looming for you? Today’s guest gracefully has entered her fifth decade and shares some great tips with us including the biggest mistakes she sees women 40+ making in terms of health, exercise and nutrition. She also reveals what she’d ‘do over’ if she had the chance on the road to 50. 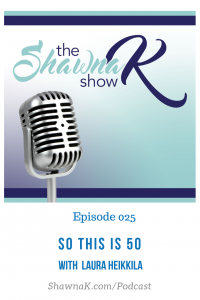 You’re going to love my guest Laura Heikkila and the nuggets she shares about being the age 50 and beyond. At the age of 50, a business owner, wife and a mother of a 16 year old daughter, Laura, doesn’t just talk about fitness and health; she lives the lifestyle and has the credentials to help others achieve their fitness and wellness goals. Taking all of her experience as a certified Holistic Health Practitioner, personal trainer, nutrition coach, and yoga instructor, Laura created reNew Wellness Studio in order to help her clients achieve a healthier lifestyle…restoring and fortifying the mind, body, and spirit. Laura is passionate about helping women through the struggles of aging, peri-menopause, and menopause through her 5 Step Hormonal Balancing and Wellness Program. Laura works with each individual client on a customized, personal approach to fitness and wellness. By taking this detailed approach, she can be sure to provide a fitness and wellness plan that directly fits her clients needs.